Those who dreaded the ‘Silicon Valley’ reality TV series that aired this past year on Bravo did not have much to worry about after all. The show received mostly negative reviews and had a lackluster performance in the ratings department, and it doesn’t seem likely to return — at least not to chronicle the tech scene here in California. But today we got word of a new TV show also dubbed ‘Silicon Valley’ that seems like it should be really worth watching. The PBS history series American Experience has made a new documentary focused on what fueled the fire for Silicon Valley and the modern tech industry’s earliest days — the founding of Fairchild Semiconductor in 1957 by the then 29-year-old Robert Noyce, an icon in Silicon Valley who a young Steve Jobs later counted as a key mentor. The ‘traitorous eight’ who founded Fairchild Semiconductor. 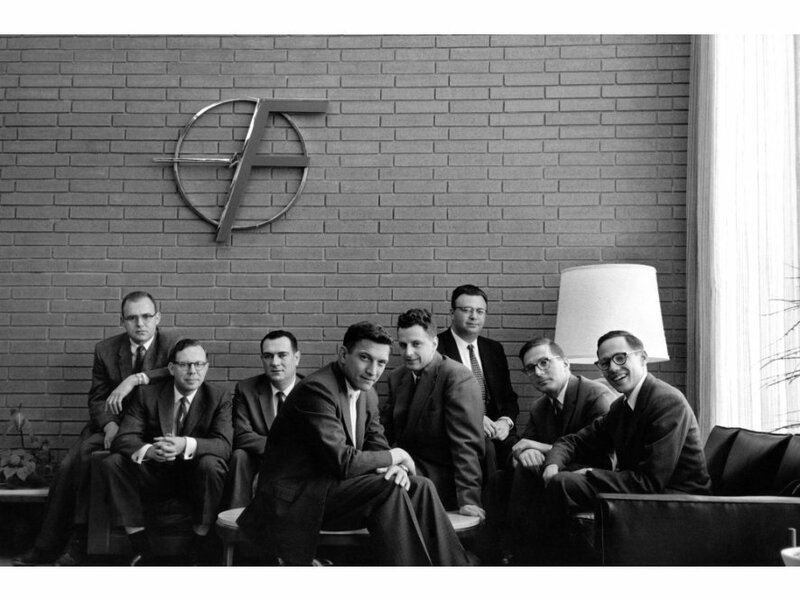 From left: Gordon Moore, Sheldon Roberts, Eugene Kleiner, Robert Noyce, Victor Grinich, Julius Blank, Jean Hoerni and Jay Last. But in the meantime, embedded above is a short trailer, and below is the plot synopsis the show’s publicity arm is sending around. It all looks pretty fascinating, and should be a great way for us relatively wet behind the ears Silicon Valley newbies to learn the real history of the early industry mavericks who paved the way to today. “In 1957, before Apple and Google, before stock-option millionaires and billionaire venture capitalists, a group of eight brilliant young scientists defected from the Shockley Semiconductor Company — the first company to work in the field of silicon semiconductors — in order to start their own transistor company. The “Traitorous Eight,” as they were dubbed, created Fairchild Semiconductor, a company whose radical innovations helped make the United States a leader in both space exploration and the personal computer revolution, transforming the way the world works, plays and communicates. Their leader was 29-year-old Robert Noyce, a physicist with a brilliant mind and the affability of a born salesman. Over the next decade, Noyce ran the new company and co-invented the integrated circuit, which would become an essential component of modern electronics including computers, motor vehicles, cell phones, and household appliances. Told through the story of Noyce, who went on to found Intel, Silicon Valley is a vibrant examination of the rough-and-tumble early days of the high tech industry and the thrilling interplay of cutting-edge science and high-stakes business that defines the unique culture of Silicon Valley. Directed by Randall MacLowry, Silicon Valley premieres on American Experience on Tuesday, February 19, 2013 from 8:00 to 9:30 p.m. ET on PBS (check local listings). On October 4, 1957, the young founders of the newly minted start-up heard some startling news: the Soviet Union had just launched the first artificial satellite into orbit around the earth. With the United States scrambling to catch up, the timing couldn’t have been better for the upstarts at Fairchild. Eisenhower quickly launched NASA and the nation’s new obsession with technology provided the opportunity of a lifetime. In less than two years, Noyce would co-create a groundbreaking invention that would help put men on the moon. But Noyce’s innovation — the integrated circuit — would have an impact far beyond the Apollo program. The integrated circuit, also known as the microchip, would re-shape the future, making possible the invention of smart phones and digital video recorders, pacemakers and microwaves possible, and launching the world into the Information Age. Not only did Noyce’s invention transform the world, his management style launched the unique business culture for which Silicon Valley would come to be known — openness over hierarchy, risk over stability, jeans over suits. This revolutionary new style continued at Noyce’s next venture, Intel, which in 1971, introduced the world’s first microprocessor, the driving force of every digital product we use today, and the heart of a 100-billion-dollar industry.